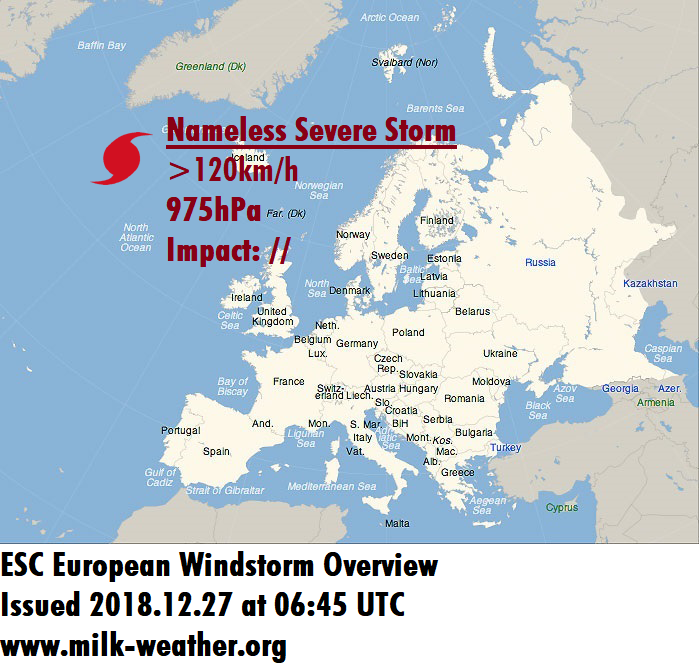 A severe storm packing wind speeds in excess of 120km/h is currently located over the northern Atlantic, roughly to the south of Greenland and southwest of Iceland. The storm, which had a central pressure of 975hPa in the last analysis, is not expected to make landfall in any European countries (Iceland included) before it dissipates, therefore posing minimal risk. No warnings or watches have been issued for it. However, a new storm is expected to form over the Atlantic during the 48 hour forecast period. It may move towards the British Isles by the end of said forecast period, potentially hitting the northern coasts of Ireland with storm gusts and possibly even bringing some severe storm gusts in excess of 120km/h to Scotland. This would take place in the night from Friday to Saturday. As this is still a while away, changes in the forecast are possible. For now, a storm watch and severe storm watch have been issued for Ireland northern & northwestern coasts and for Scotland, respectively. 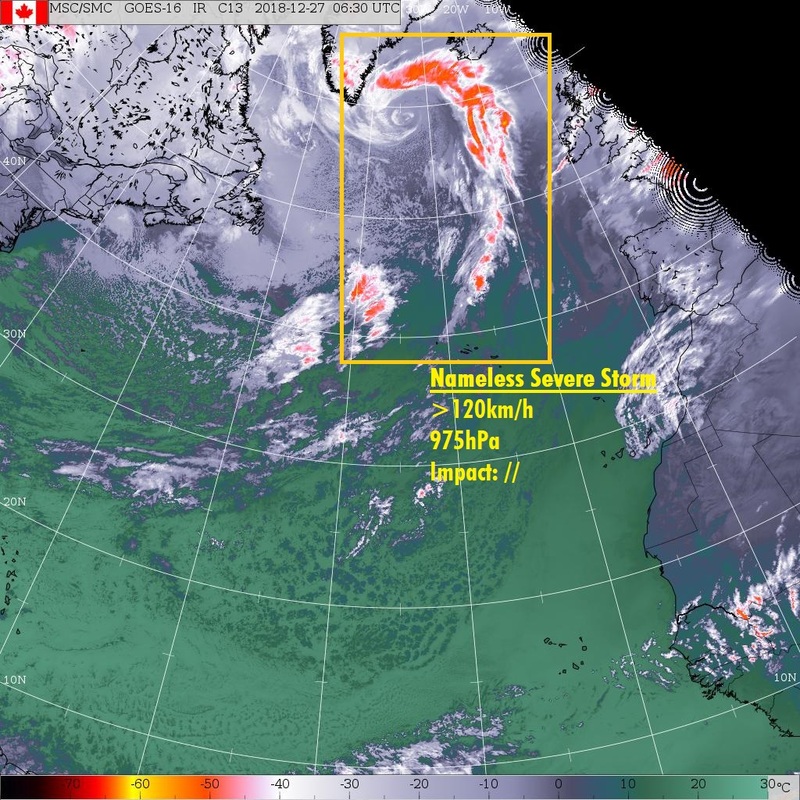 Below you will find the current storm warnings & storm watches, the satellite image of the storm and the overview of the currently active systems. This entry was posted in Uncategorized and tagged analysis, Atlantic, europe, forecast, satellite, Storm, windstorm on December 27, 2018 by Linus Höller. There are currently two storms around Europe. 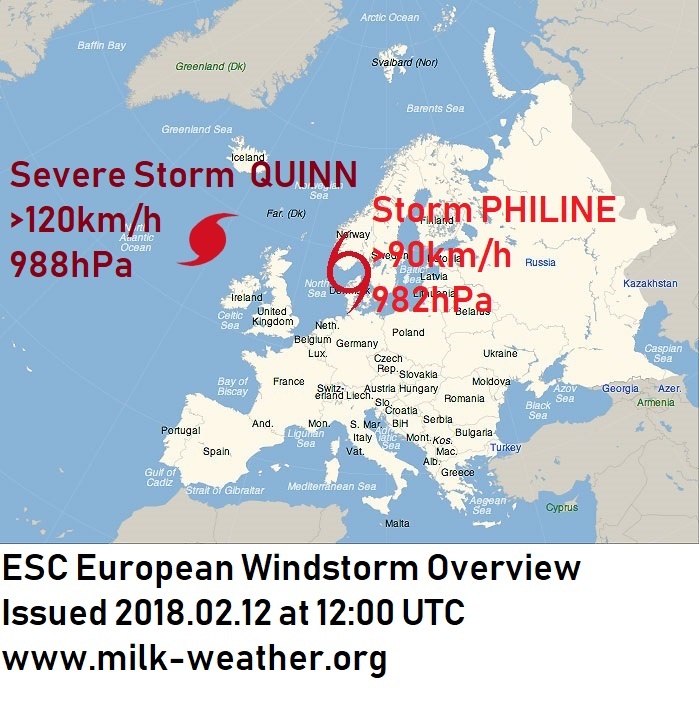 Storm PHILINE, currently located over Denmark, is expected to more or less dissipate within the next 24 hours, and is currently only bringing storm gusts to a fairly small area consisting of Denmark and the far north of Germany. However, from the northern Atlantic, a new storm is approaching: severe storm QUINN, currently located to the northwest of Ireland, is packing gusts exceeding 120km/h and has a central pressure of 988hPa. 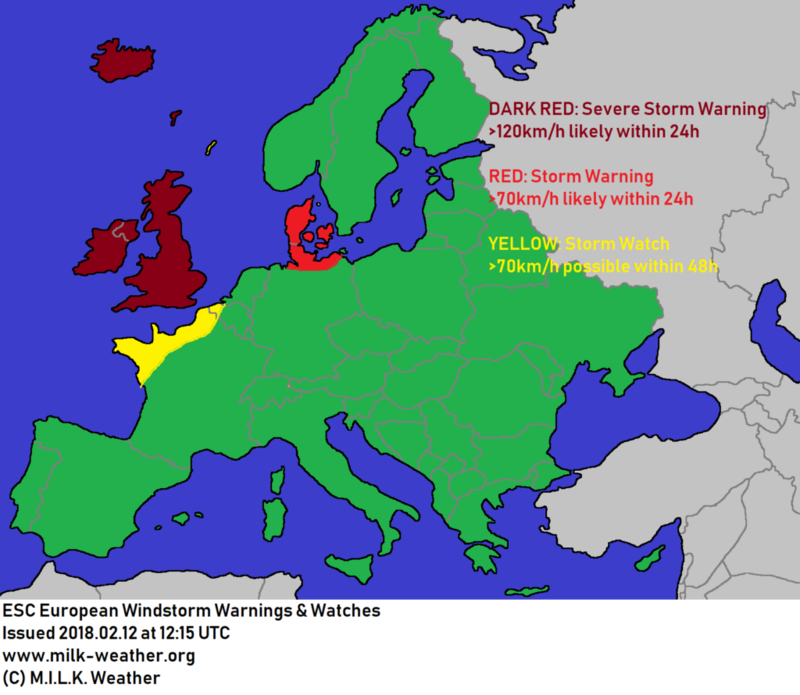 It is expected to strike Ireland and, a few hours later, the UK in the coming night, bringing wide-spread storm gusts and some severe storm gusts, especially in exposed locations. The storm will move northeast or north-northeast, and will also bring severe storm gusts to parts of Iceland by tomorrow morning. The French coast may be impacted between tomorrow morning and the early afternoon, as well. Storm warnings and watches have been issued accordingly. See below. 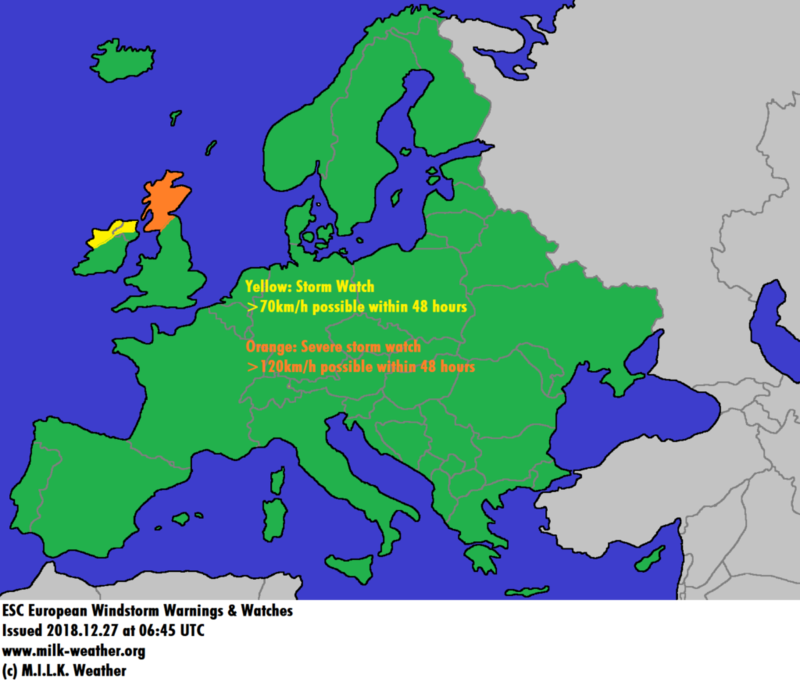 Below: ESC European Windstorm Overview, Warnings and Watches. This entry was posted in Uncategorized and tagged Denmark, Germany, Iceland, Ireland, Storm, Sturm, UK, Weather on February 12, 2018 by Linus Höller.